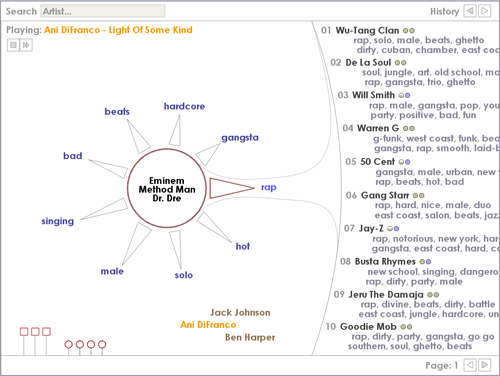 MusicSun is a graphical user interface to discover artists. Artists are recommended based on one or more artists selected by the user. The recommendations are computed by combining 3 different aspects of similarity. The users can change the impact of each of these aspects. In addition words are displayed which describe the artists selected by the user. The user can select one of these words to focus the search on a specific direction. Elias Pampalk & Masataka Goto, "MusicSun: A New Approach to Artist Recommendation", in the Proceedings of the ISMIR International Conference on Music Information Retrieval, 2007. The following videos describe the basic features of the user interface. MusicSun was developed at the AIST as part of the CrestMuse Project which is supported by CREST, JST. The interface is built with Processing. Related music discovery interfaces include the MusicRainbow.